Prime Minister Narendra Modi's ambitious plan to connect rivers across the country to tackle India's deepening water woes has been boosted after wildlife authorities in Madhya Pradesh state gave the green light to sacrifice part of a tiger reserve. But environmentalists opposing the national interlinking project - estimated to cost more than US$100 billion (S$142.8 billion) - say it would affect the natural flow of rivers, lead to water-logging and affect local ecology. They are particularly concerned about the Madhya Pradesh phase linking the Kenand Betwa rivers, which will submerge about 10 per cent of the Panna reserve - home to at least 24 tigers. "Not only will the river linking submerge prime tiger habitat in Panna's core, but it will also impact critically endangered gharial (crocodiles), vultures and other rare wildlife," said Ms Prerna Bindra, former member of the National Board of Wildlife. Not only will the river linking submerge prime tiger habitat in Panna's core, but it will also impact critically endangered gharial (crocodiles), vultures and other rare wildlife. Besides the actual physical loss of habitat, there will be ancillary activities (like construction) which will impact a far greater area. "Besides the actual physical loss of habitat, there will be ancillary activities (like construction) which will impact a far greater area." India has around 16 per cent of the world's population but only 4 per cent of the planet's water resources which are seen as mismanaged because of increasing pollution and overdrawing for irrigation purposes. 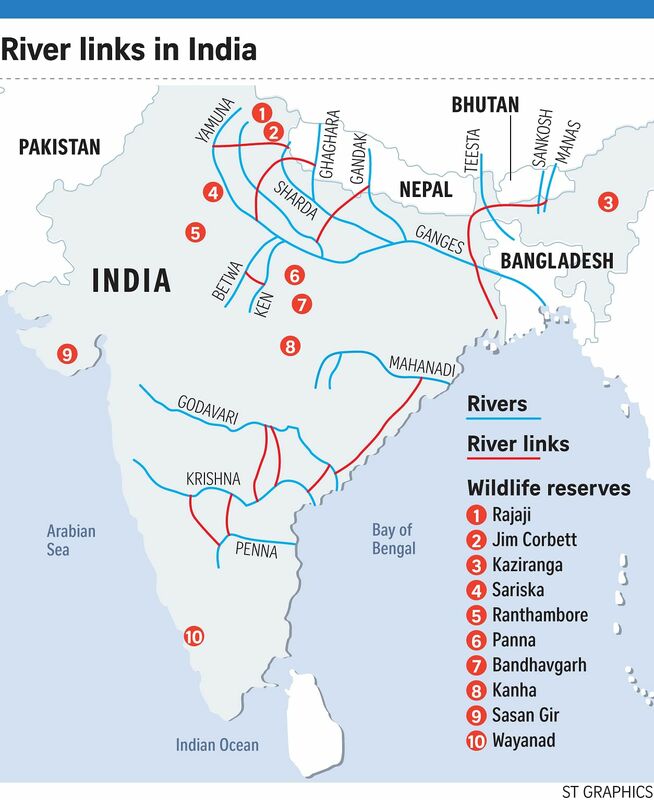 With pressure on water expected to intensify, the Modi government has revived a plan first envisioned in the 1980s to connect 37 Himalayan and Peninsula rivers through 30 links by building canals and dams to feed water-deficient rivers. While the federal environment ministry has still to approve last week's agreement with state wildlife authority, the government is hoping to start work soon and said it is taking steps to safeguard the tiger population. The project also requires approval of the Supreme Court as it is a protected reserve. "We will take care of all environmental aspects. It is not that we are compromising on environmental issues," Mr S Masood Husain, director-general of the National Water Development Agency, told The Straits Times. "We believe in balancing environmental as well as development needs." He said the government is also working to add almost 8,000 hectares of forest land to compensate for the loss of around 5,800 hectares in the reserve. "We are hopeful we will get environmental clearance very soon. We hope that by March 2016 we will be able to start work," Mr Husain said. Though the previous Congress government remained unconvinced about river linking during its 10-year tenure, it has remained a pet project of the ruling Bharatiya Janata Party (BJP) and Mr Modi has been pushing it. In September last year, a special committee was set up to guide implementation of the river links while in April this year a task force of experts and senior officials was set up to look into issues facing river linking. While the project is also expected to help in cargo movement through the waterways, Mr Husain said river interlinking was essential for "India's water security". "By this interlinking of rivers programme, 35 million hectares of irrigated area and 34,000 megawatts of hydropower will be added over and above conventional water resources. It is very essential for water security and food security." Still, the entire project is expected to be a challenge for the Modi government on funding and getting approval from states on a resource that excites high emotions. Some states such as Tamil Nadu and Karnataka already fight over water sharing - in their case, the Cauvery river. Others such as the eastern state of Assam and southern state of Kerala have expressed concerns about sharing their water resources. "No state wants to give its share of water to another state. Since interlinking of rivers involves giving water to states in another basin, that cannot happen until donor states agree to give their share of water," said Mr Himanshu Thakkar of South Asia Network on Dams, Rivers & People, a non-profit organisation. "The river-linking proposition lacks scientific basis," he said. "To decide if a river basin is in surplus or deficit, one needs to exhaust all the options in the river basin starting from rainwater harvesting, groundwater recharge, watershed development... But we have not done such an assessment in any river basin or sub basin."